In the center of Bosch’s CES booth was the prototype of an autonomous electric shuttle with a slew of surprising features. Riders can open the door of the vehicle using a smartphone app known as Perfectly Keyless. Once in the vehicle, a passenger has access to a concierge service that can inform a passenger if, say, an upcoming flight has been canceled and which alternate flight they would prefer. The concept vehicle also was equipped with camera sensors that could detect if a rider is about to leave an object behind when exiting the shuttle. The same sensors can determine when the vehicle needs to have its interior cleaned. Such experimental prototypes are important for an engineering-focused company like Bosch because of the feedback about the types of features the public, city officials and other demographic segments value. With the shuttle (pictured below), the company wanted to “paint the picture of what could be,” said Mike Mansuetti, president of Bosch North America, pictured above on the right. And from there, they can use feedback from such experiments to better understand what should be. Many AI- and IoT-enabled projects sound nice in the abstract, but can still fail to win the support of end users. But ultimately, such information can spur further brainstorming for the company’s engineers and executives, who can then investigate the role that, say, transportation might play in such matters. “It is just a mindset change in the organization,” Mansuetti said. Technologies such as AI and IoT are helping drive closer collaborations across its four core divisions, which span mobility solutions, consumer goods, industrial technology and energy and building technology. “We are starting to see more of the work happening horizontally in the organization,” Mansuetti explained. 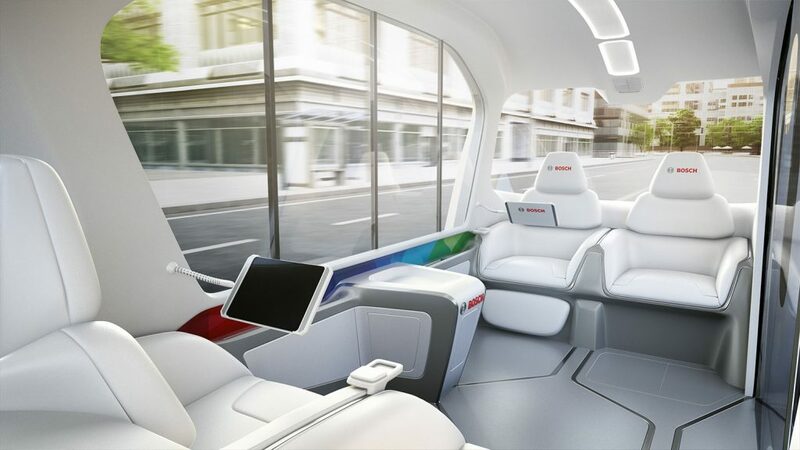 The prospect of autonomous shuttles becoming mainstream in the not-too-distant future led Bosch engineers to wonder how to handle potential problems that arise in such vehicles when no person is physically present to address them. “That’s where this idea around in-vehicle sensing came,” Mansuetti said. “When you think about transportation as a service now, or mobility as a service, what are all those things that could happen?” A passenger could leave a smartphone or wallet behind, step into a dirty vehicle or a physical confrontation could occur between two passengers in the vehicle. “When nobody’s there, then you just start thinking about these things.” And it is this thought process that led the company to develop prototype solutions for such challenges. In other words, that’s a problem the company has decided is not worth solving.